Last year I had to migrate the news blog section of the Staple! site from an ancient version of Movable Type (version 2.x) to Blogger. Even though Blogger has recently dropped features and seems mostly deprecated in favor of Google+, for this site there were a ton of existing users on Blogger. Upgrading just made sense. However, what a file format mess. Export in Movable Type’s custom text format; import in Blogger’s Atom format. So first step is to find a service that’ll convert between the two, then manually fix up usernames so it imports properly. I exported, tweaked, and imported this file at least a dozen times before getting it right. I was so frustrated because this wasn’t just accidental bugs. Developers made conscious choices that led us to this compatibility dead-end. They bet against Dave Winer and lost at a pivotal time in the development of blogging. We had a format that was perfect for both blog syndication and as an interchange format between systems: RSS. Instead, some developers criticized RSS, then proceeded to create new products that have not been well cared for. That is now part of their legacy. 10 years after blogging went mainstream, the end result of reinventing the wheel isn’t better software, it’s user frustration trying to get anything to work together. If you have a choice, always pick the old boring format that works above the new hotness that is only theoretically better. 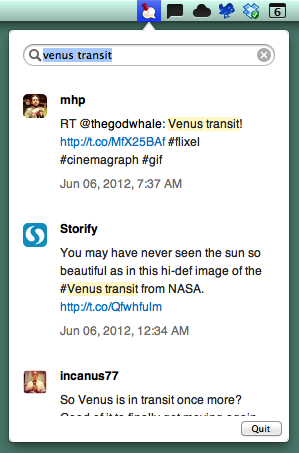 This entry was posted in Weblogs and tagged atom, blogger, movabletype, rss on 2012/07/27 by manton. Dave mentions libraries several times in his blog post. It’s no accident that the word “library” is in Tweet Library’s name; my ambition for this app far outpaces my coding speed. But blogs are a different problem, and they need something special — perhaps multiple solutions. This entry was posted in Technology and tagged archive, blogs, preservation, riverfold on 2012/07/20 by manton. Despite everything I said about how easy it would be for customers to upgrade from the Mac App Store version of Clipstart to the direct download version, in the real world this doesn’t appear to be working well for some customers. Might be a little buggy, and it’s too late to fix anything in the Mac App Store. So I’m doing upgrades the old-fashioned way, giving everyone new serial numbers. After the first few emails came in, I automated this with a simple form that customers can fill out. It’ll give them a new serial number right away and email the registration information. I’ve added a link in the FAQ on the Clipstart home page too. This entry was posted in Programming and tagged clipstart, mas, registration on 2012/07/19 by manton. This was part of a theme on today’s Core Intuition episode as well, not just sponsorships but also whether having an audience changes how we write tweets and blog posts. Daniel Jalkut and I have been very lucky with Core Intuition so far to have great sponsors: apps and events we already love like Marco’s own Instapaper, Smile’s TextExpander, CocoaConf, iDeveloper TV, NSConference, and Glassboard. Eventually we’ll be approached by more apps and services that we don’t have as much experience with, but as long as we keep our voice and honesty, I’m not too worried. This entry was posted in Podcasts and tagged blogging, coreint, sponsors, twitter on 2012/07/18 by manton. I’ve never liked the idea of being exclusive to the Mac App Store. I don’t think any of those transitions — from 1Password to Pixelmator — were good for users, especially when customers had to re-purchase a product they already owned. I hope sandboxing will at least make more developers think twice about pinning their business to the Mac App Store. In other words: it’s good for some users and some apps, and not others. And that’s okay. I have no regrets about pulling Clipstart from the Mac App Store. I think of my app as pretty easy to use, but it’s for people who get file systems and tagging and uploads. Most definitely not for people afraid of using a computer. This entry was posted in Programming and tagged 1password, clipstart, mas on 2012/07/17 by manton. Added “Consolidate” command for finding videos that have not been imported or duplicates outside the library. Support for Mac OS X 10.8 Mountain Lion’s Gatekeeper security. If you’ve been thinking about buying Clipstart but were on the fence before, I’ll throw in a discount for you. Use coupon code MANTONBLOG to save 20%. This entry was posted in Programming and tagged clipstart, discount, macappstore on 2012/07/02 by manton.